* "Can't you just sell your CDs and make money that way?" 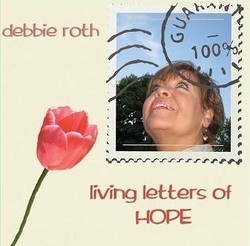 Countless times, Debbie has been approached with a story that begins with "I have a friend..."; or "My mother/sister/cousin really needs this message"; and the result is always the same: a CD is given, no strings attached, in hopes that God will bless the listener and touch a heart. 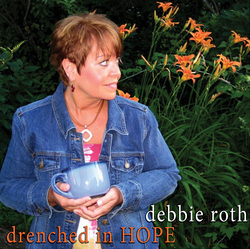 * REST IN HIM MINISTRY isn't about being a speaking & singing sensation, it's about sharing the Hope of Christ. Actual sales are fairly limited, but actual ministry is fairly widespread. The first, only HOPE in the storm, can be likened to a patient first receiving a drastic diagnosis and calling out to God in pain. In the second, endless HOPE, is an expression of perseverance in the face of hardship; kind of like being in survival mode. Number three, drenched in HOPE, includes unashamed worship; celebrating victory in Christ no matter what the current circumstance. Number four, living letters of HOPE; we now are the carriers of the good news of HOPE to others. Others need to hear our stories!